Yellow-rumped warbler in juniper tree, Oct 29, 2017, Madison, Wisconsin. I saw this adorable little bird a few days ago while we were on her afternoon walk. We were near the river and I noticed a small, speckled bird with a brown back and white underside on the trunk of a tree. At first I wondered if it might be a brown creeper, since I had spotted a couple of those in the previous week. While I with my binoculars to my face, it tweeted and flew off— but not far. Only across the street to be closer to the river, landing in a large juniper (or is it a cedar?). We tiptoed toward it, me constantly waving at companion and awkward attempt to get him to stop talking so as not to scare my binocular-target off. I needn’t have worried. A whole tree was full of these birds. Whether I saw the original one that led me there again or not, I observed plenty of its brethren. “I think those are yellow-rumped warblers,” I said, not exactly sure why I thought so except for the fact that they had little spots of yellow on their backs, between their wings. I’ve never seen one close up before, so I didn’t have experience to go on. “I think it’s a pie-billed coot,” said Companion. “Pie-billed coot” is what Companion calls any bird that he can’t identify. That or “weeva bird.” I thought these were more “weeva bird” size (the neologism comes from “wee-of-a”), but I didn’t argue. I took lots of pictures, and when I got home, I checked Merlin and found out that they were indeed yellow-rumped warblers, not pie-billed coots, after all! 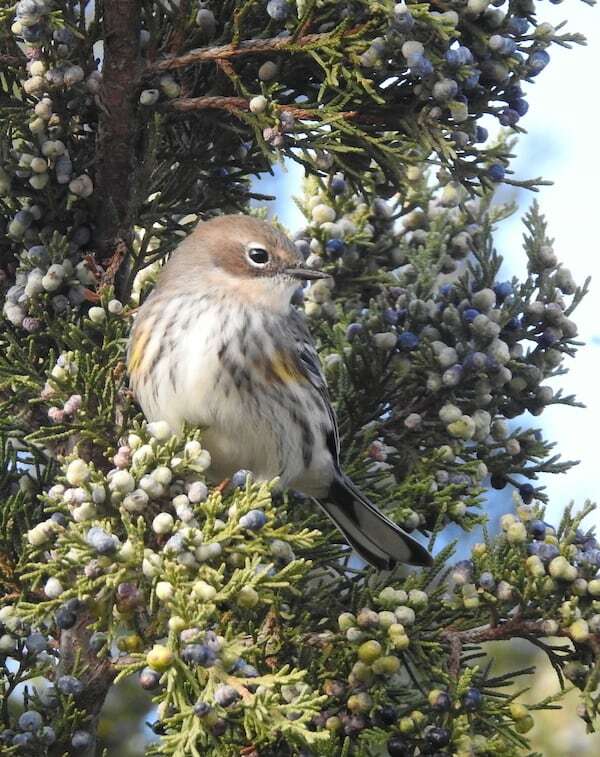 Want to see more pictures of yellow-rumped warblers? Check out their page on All About Birds, where you can see them in their fall plumage and in their breeding plumage, as well. In their breeding plumage, they look like a whole different bird.